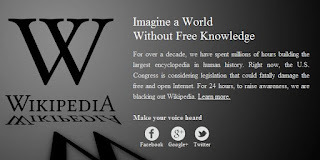 Joel's Jottings: Wikipedia's Blackout - A Necessary Stand? Wikipedia's Blackout - A Necessary Stand? Wikipedia’s protest, by a 24-hour black-out, has suddenly made the world realize how much it has begun to depend on this free online encyclopedia. Can the world live without Wikipedia for one day? The answer is, perhaps this : “with very great difficulty.” And most of the world quickly realized it. But is this new type of strike, of shutting Wikipedia’s English website down for 24 hours, really a wise move? 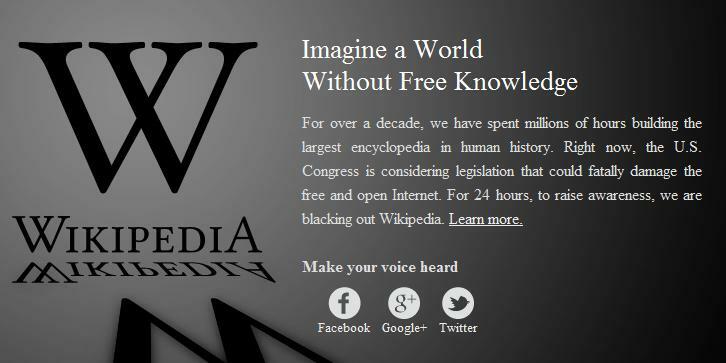 Is Wikipedia right in protesting against the two legislations, SOPA and PIPA, which the US Senate is deliberating on? SOPA is short for the "Stop Online Piracy Act," and PIPA is an acronym for the "Protect Intellectual Property Act”. These bills are efforts to stop copyright infringement committed by foreign web sites, but, according to Wikipedia, they do so in a way that actually infringes free expression while harming the Internet. Wikipedia says that both are badly drafted legislations that won't be effective at their stated goal of stopping copyright infringement. The bills will apparently put the burden on website owners to police the user-contributed material, and call for unnecessary blocking of entire sites. According to Wikipedia “Small sites won't have sufficient resources to defend themselves. Big media companies may seek to cut off funding sources for their foreign competitors, even if copyright isn't being infringed. Foreign sites will be blacklisted, which means they won't show up in major search engines. And, SOPA and PIPA are building a framework for future restrictions and suppression”. This, they say, is unjust. Wikipedia’s arguments, that the bills will only be acts of ‘restriction and suppression’ of an open internet, may hold some water. But check out my next paragraph. I saw one of my facebook friends’ mention on his status “I’d hate to be completing my university project today”!! This clearly brings us to the real question of plagiarism and piracy which the proposed legislations are seeking to prevent. The fact that tech companies in Silicon Valley and the media companies in Hollywood are supporting the legislations, is a clear indication of how important these companies are valuing their intellectual property; and how they do not want any copyright infringement. If I am Britney Spears, for instance, why should some website – like youtube – allow its users to upload my video song which is 'ripped from a DVD’ or ‘copied from a TV Channel’ onto the website, from where it can then be downloaded again, by the website’s several other users, who even convert my video into audio formats and play it in their parties, with absolutely no revenue to me?? Where are the returns due to me, the real Britney Spears? How can all you users enjoy my song, my hard work, my intellectual property, without giving anything to me? Luckily, however, YouTube is seen working hard with its Content ID software to prevent unauthorized copyright violations. But several youtube-like, me-too, sites are only encouraging piracy. And millions are acting as if there is nothing wrong. Why? Well, who doesn’t want a freebie? I believe, in today’s world of copy-paste, it is not just typed material, available in html format that that can be used for plagiarism. I believe that the DVD Rip software, the download convertors, and free download websites are all harming the original copyright owners. They should be given their due. So, while I do not entirely agree with Wikipedia, in its support of other websites opposed to the bills, I am thankful that, in a way, it highlighted the issue by spreading awareness of intellectual property rights. Self-contradictory as I may sound, my stand is this: restriction and regulation on Internet may seem extremely difficult, but it is necessary. Youtube is a very good example on how it is doing its best to prevent copyrighted material from being uploaded to its site, although not entirely successfully. All website should do their best to protect intellectual property of people like artists, writers, musicians and even software programmers. Maybe the two bills need some tweaking and fine tuning but they will ensure that 'creativity of the mind' gets its due credit.